Glass is not just a mere object to view our surroundings, it has become an integral part of our buildings today by playing a vital role in comfort, energy efficiency, hygiene,day lighting security accessibility, and much more. Evolving from a building material to a technological advancement that paves way for a sustainable future, glass has truly become the need of the hour. In order to fulfill the potential of glass in buildings, it is necessary to “enhance competence of key personnel involved in design, selection, processing, installation & maintenance of glass products”. Glass contributes a whole new level of aesthetics, energy efficiency, safety, security and comfort to the buildings of today. At the heart of the transformation wrought in glass are those who visualize, create and execute with the wonder material. The only limits to what they can envision and create are the availability of right glass solutions, their own knowledge, and skill gaps with glass. In short, selecting right glass solution for right application in safe and energy efficient manner is important. It is with a view to endow knowledge and skills on glass as a building material. To share the latest trends that govern the structural and aesthetic possibilities of this Quintessential material. To be an Industry-professional-academia interface that would pioneer knowledge dissemination among the various stakeholders. To understand the significance of glass today, it takes knowledge and information from those who’ve had years of experience to master the subject. The glass Academy thus brings together quintessential information for these experts in order to educate, develop the skills of the various stakeholders of the industry and in turn fulfill the potential of glass in contemporary building spaces. From learning about green habitats to glazing against fire, one can learn, develop and shape his dreams through the first-of-its-kind knowledge platform. E Learning – a wide range of online learning courses on various categories aiming to educate the various segments of stakeholders on the Glass & Glazing techniques. 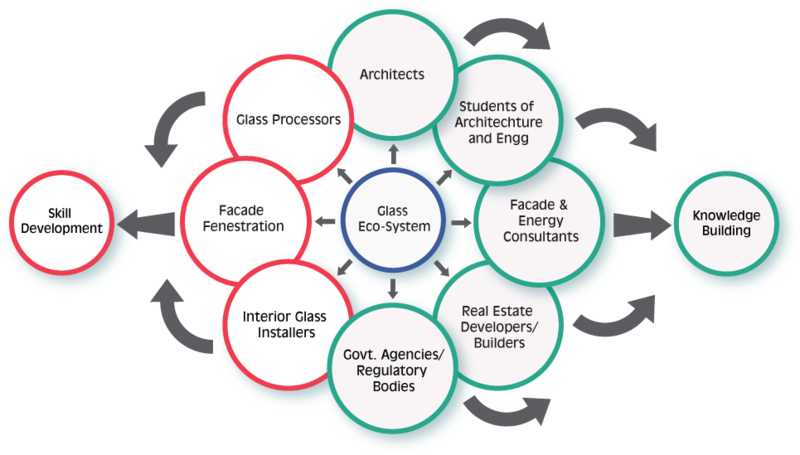 Glass Curriculum – a curriculum on glazing, designed for undergraduate & postgraduate level programs of engineering and architecture standards. Enlightened Spaces – numerous webinar sessions delivered by the who’s who of the academia and industry to share the knowledge on concepts & best practices in the field sustainable Architecture & Construction. Glass Explore – a national level fellowship program in association with premier institutions and industry partners for promoting research in the field of Glass, Glazing and its applications. Glass Workshops – On-site workshops on different themes for various segments including Architecture, Engineering, Safety & Fire protection to inculcate the right knowledge and skills. SKILL BUILDING INITIATIVES – An set of initiatives that strives to impart Glass Processing, fabrication & fenestration along with interior Glass installation skills to new entrants and existing workforce to build a bank of skilled workers in the industry.